Badger Games has 1866 Miniatures Now! 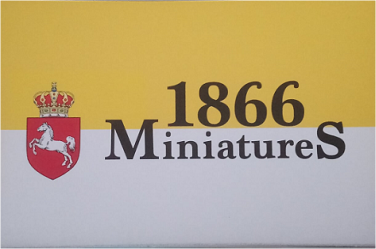 We are excited to announce that we are now carrying the complete and expanding line of 1866 Miniatures. We have great stocks and will add new product as it becomes available. Sculpted by Company D’s Phil Murphy, these fantastic miniatures are perfect for the “small wars” leading to the Franco-Prussian War. These long neglected European conflicts are finally getting the attention they deserve, and 1866 Miniatures allows you to recreate some of the forces involved. 1866 Miniatures allows you to affordably build up unique forces for this exciting period. The entire range is pictured on our site or you can see them at our booth at Historicon in a few weeks! This entry was posted on Tuesday, June 19th, 2018 at 09:28 and is filed under News. You can follow any responses to this entry through the RSS 2.0 feed. You can skip to the end and leave a response. Pinging is currently not allowed.